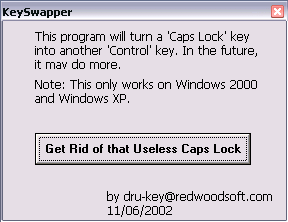 This Win32 executable is a simple tool for changing the CAPS LOCK key into another CONTROL key. It uses the Windows 2000/XP scancode remapper. Enjoy. Note: This isn't working now that Microsoft dropped the old Microsoft JVM. The program just does what this MSDN article describes. Or just put this in a text file, import it with the registry editor, and reboot.